More than 20% of sewage waste is dumped untreated into Indore's water supply, while 80% of it's sewers are under-utilized or blocked. Such conditions may increase exposure to microbial pathogens and compromise water potability. This article reports an environmental risk assessment of Indore's Khan River based on existing literature, including hazard identification, dose-response and exposure assessment, identification of susceptible populations, risk characterization, and potential community-oriented management and communication approaches. Water has become a scarcity in Indore, India and has led the city to obtain water from the Narmada River over 70 km away [Figure 1]. However, even this water supply is insufficient. More than 20% of sewage waste is dumped untreated into the water supply, while 80% of the sewers are underutilized or blocked. To help understand the sewage river pollution in Indore, we present herein a brief analysis of the Khan River using a qualitative risk assessment approach. Ideally, sewage waste is treated and disposed of by sewage treatment plants. However, due to lack of regulation and capacity in Indore, a large portion of the sewage is poured straight into the Khan river. When sewage networks become clogged or overworked during monsoon season, they can cause overflow and allow sewage to disperse along the streets, especially in slum areas. Many open sewers, as depicted in [Figure 2], can also overflow and lead to adverse health effects [Figure 2]. Agent of concern: Sewage waste, which can include both chemical (e.g. nitrates, phosphates, heavy metals) and biological agents (e.g. harmful pathogens)., Coliform bacteria levels were shown to be increased in the Khan river after sewage contamination [Figure 3]. Microenvironments of concern: Outdoor bathing (organized); sections of rivers used for recreational purposes; during sewage overflow, homes and streets are of concern, especially for those who live in slums near a river, and all those who use the public water supply. Possible sources/pathways: River → drinking water supply → contact with humans (ingestion); River → direct contact with humans (dermal); River → air → contact with humans (inhalation); River → attachment to surface → contact with humans (multiple routes); River → algal blooms → food source (e.g. fish) → contact with humans (ingestion). Routes of exposure: Ingestion, dermal contact (via skin and eyes), and intravenous exposure, if lacerated. Places near sewage treatment plants may be at a higher risk due to higher concentrations of waste. Stagnant lakes and sections of the river may also increase the risk of exposure and concentrate pollutants. Hostels, hotels, and auto garages are also known to dispose wastes that clog drainage pipes and contribute to mixing of sewage waste and drinking water. This may increase the risk of contamination near those areas as well. Children, elderly, and immunocompromised individuals (e.g. 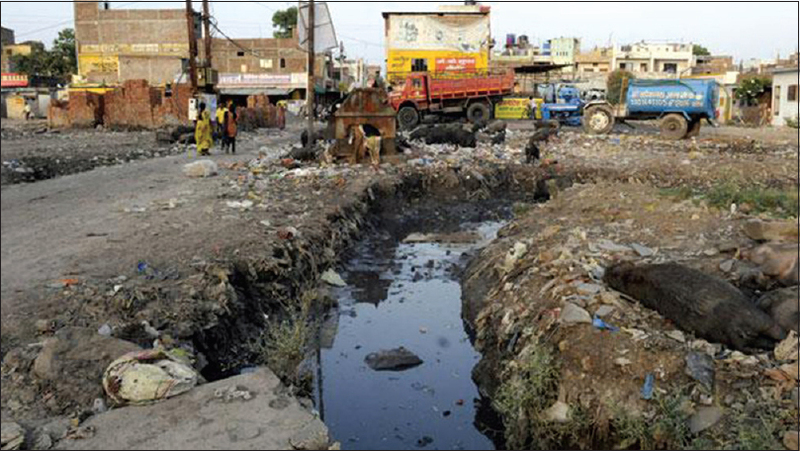 those with HIV/AIDS) are more susceptible to sewage waste pollution in Indore's water supply. Children who are exposed to harmful pathogens such as G. Lamblia or V. cholerae can contract giardiasis or cholera and have potential adverse long-term health effects such as cancer or developmental disabilities. Others exposed to such pathogens are likely to have acute effects such as diarrhea but may not face the same long-term effects as a developing child. 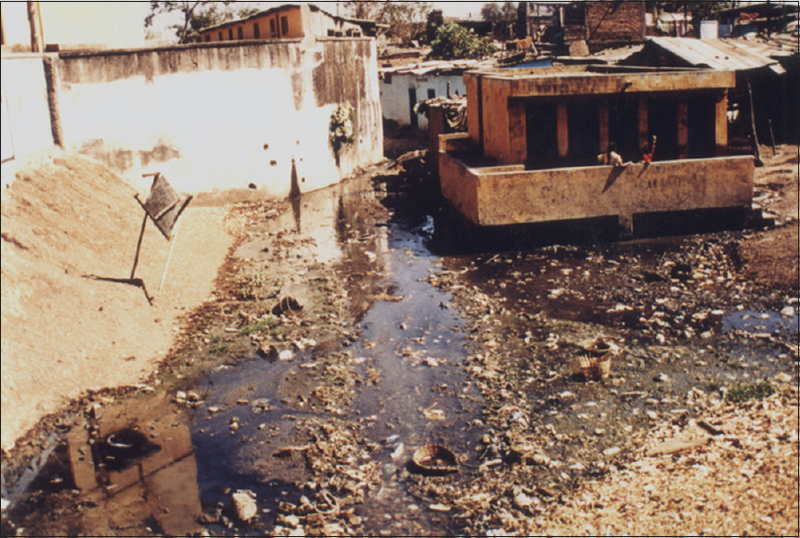 Pilot study: To determine the risk of adverse health effects attributable to sewage pollution in Indore's water supply, a cohort study can be conducted. The “exposed group” can be those in slum areas in Indore who are in daily contact with the water supply (via bathing, drinking water, occupational exposure), whereas the “non-exposed group” can be slum dwellers in other cities (Mumbai, Kota, others). These cities also have sewage problems, but to a lesser extent. The disease outcomes measured may include various waterborne diseases (cholera, dysentery, giardia, among others). Relative risks of disease outcomes will be measured for the exposed and unexposed groups to determine whether exposure to water is associated with a higher risk of disease. National River Conservation Plan (1985): Policy to improve water quality and create sewage treatment plants. Water (Prevention and Control) Act of 1974: Prevention and control of water pollution. Provides national water quality standards for drinking water and sewage treatment. Some states, including Madhya Pradesh, have recently set stricter standards to reduce sewage pollution. However, both have failed to act against violators. Neither of these legislations were effective, which led to their dismantling in 2014. Educate residents to not go into the water supply without caution and not dispose waste in it. Establish infrastructure for those in the slums to reduce the amount of outdoor defecation and contamination of the water supply ([Figure 4] depicts such a toilet block funded by the World Bank) [Figure 4], and ensure household connectivity for the drainage and disposal of solid waste. Create a better waste treatment system as well as a sewage network in Indore (this has been partially completed through the renowned slum network model) [Figure 5]. Boil drinking water when possible to reduce the load of bacterial pathogens. Use technology (e.g. solar power) to reduce cost and increase efficiency of current water supply system. Educate upper class citizens to reduce water usage. The government should be involved along with the public at every level to ensure that WHO “Guidelines for Drinking-water Quality” are being met and the public is informed. Audience-focused communication via a credible source should be used to enlighten people on water-related issues. Surveys can be conducted to assess people's willingness of having a better water supply. Risk assessment and acceptable level of risk should be explained to the public so that they can make an informed opinion and take proper decisions. Centre for Science and Environment (2011). 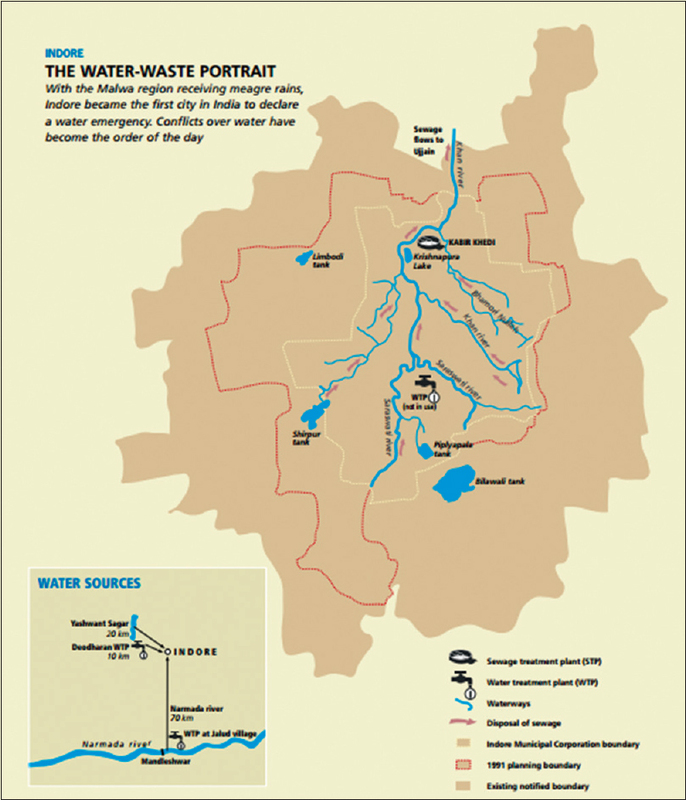 Indore: The Water-Waste Portrait. Available from: http://cseindia.org/userfiles/indore_portrait.pdf. [Last accessed on 2015 Nov 21]. Jha B. (2012, July 9). Indore, Bhopal pollutes its water resources, heavily dependent on Narmada. Available from: http://timesofindia.indiatimes.com/home/environment/pollution/Indore-Bhopal-pollutes-its-water-resources-heavily-dependent-on-Narmada/articleshow/14772006.cms. [Last accessed on 2015 Nov 21]. Sharma R, Sikka J, Bajpai N, Waghela D. Impact of Domestic Sewage and Industrial Effluent on Water Quality of the Khan River, Indore (India). Pollut Res 2012;31:289-96. Gurjar M, Chourey VR, Dwivedi D, Vyas R. Physico Chemical Assessment of Groundwater in Indore City. Curr World Environ 2013;8:117-21. Dega S. (2014, November 10). 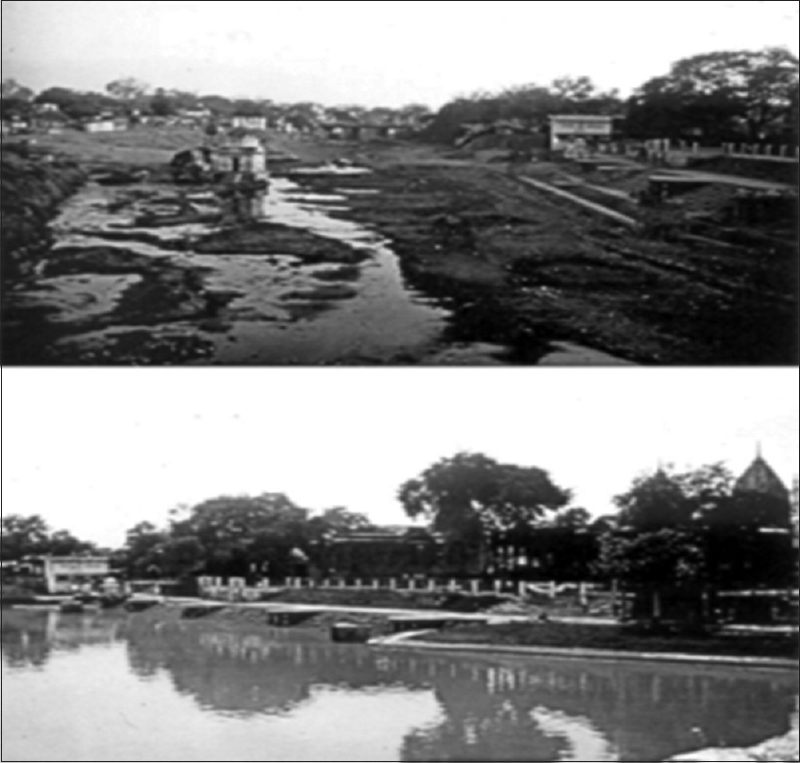 Restoring Indore's Lakes to Create an Emergency Water Supply. Available from: https://www.rockefellerfoundation.org/blog/restoring-indores-lakes-create/. [Last accessed on 2015 Nov 21]. Petri Jr WA, Miller M, Binder HJ, Levine MM, Dillingham R, Guerrant RL. Enteric infections, diarrhea, and their impact on function and development. The Journal of clinical investigation. 2008;118:1277. Parikh H. (2014, October 5). Slum Networking of Indore City. Available from http://architexturez.net/doc/az-cf-166249. [Last accessed on 2015 Nov 21]. Purohit M. (2014, February 8). Solutions to Indore's water problems don't have to be so expensive! Available from: http://www.indiawaterportal.org/articles/solutions-indores-water-problems-dont-have-be-so-expensive. [Last accessed on 2015 Nov 21]. World Health Organization. (1993). Guidelines for drinking-water quality: recommendations (Vol. 1). World Health Organization.